We’d love your help. 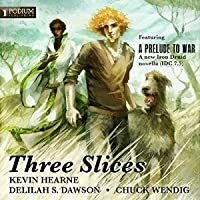 Let us know what’s wrong with this preview of Three Slices by Kevin Hearne. To ask other readers questions about Three Slices, please sign up. I read this collection of three short stories because the first one, A Prelude to War, is an introduction to Kevin Hearne's next full book and I did not want to miss anything! As a short story it was okay - too much Granuaille as usual - I keep hoping something dreadful might happen to her soon. Anyway I am now up to date on Atticus and Oberon and very ready for the next book. The second story, Not my Circus, Not my Monkey, is by a new to me author, Delilah S. Dawson. This was a great introductio I read this collection of three short stories because the first one, A Prelude to War, is an introduction to Kevin Hearne's next full book and I did not want to miss anything! As a short story it was okay - too much Granuaille as usual - I keep hoping something dreadful might happen to her soon. Anyway I am now up to date on Atticus and Oberon and very ready for the next book. The second story, Not my Circus, Not my Monkey, is by a new to me author, Delilah S. Dawson. This was a great introduction to her books which I now want very much to read. Criminy is a character you just have to have more of and you don't often come across books with flesh eating rabbits. The third story, Interlude:Swallow, by Chuck Wendig was interesting but needed some knowledge of the book that preceded it to really understand what was going on. It was a good taster though and I did list it to follow up. Kevin Hearne, Delilah Dawson and Chuck Wendig present three novellas which feature tyromancy. A form of divination involving observation of cheese. I’m a Kevin Hearne fan, more specifically a fan of his Iron Druid series and so I was interested in his story Prelude to War. Atticus travels to Ethiopia to meet a tyromancer he’s known for centuries. This leads up to the action to come in 2016’s next Atticus and Oberon adventure Staked. Hearne follows Atticus and Granuaile - but Kevin?? Where’s Owen Kennedy? I’ve never read anything by Dawson before, but her entry “Not my circus, not my monkey” is a contribution to her Blud series. Protagonist Criminy Stain is a Bludman, basically a vampire, and this fun steampunk adventure follows his creepy introduction to a traveling circus. Chuck Wendig adds a Miriam Black novella. Black has a power and / or a curse: when she touches someone she can see the moment of that person’s death. Dark and violent, Blackbirds fans will enjoy this one. I nice little Iron Druid entry. Fast and fun. First time reading this author and based on this story I will be seeking out more of her work. I liked the premise of someone who can see the day and time of your death by touching you, but did not enjoy the characters’ voice which tended towards the vulgar side. The mystery was not bad either, but cannot bring myself to go more than 2 stars. I'm not sure what happened to Iron Druid, but I loved it at the beginning, and the farther along it's gotten and the more time passes in between, I just don't love it anymore. I still like it. It's still entertaining. I really love Oberon and Granuaile and the deities and even Atticus, though. This short story was decent. Not great. Felt kinda rushed. 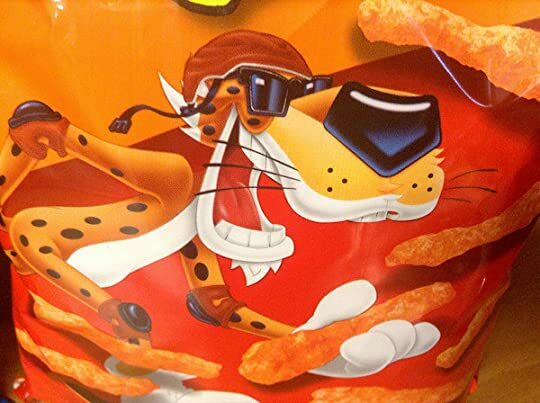 And the whole cheese-o-mancy was a little, well, cheesy. I love Miriam Black. I just do. She's got a cool power, she's strong and flawed and on some levels relatable, and she f*cking curses like a drunken horny sailor. Seriously, potty potty potty mouth! Rating is for the story: A Prelude to War by Kevin Hearne. I'm a little disappointed I had to pay 5.99 just to get to read this short (not available anywhere else), because I feel like it's a necessary part of the journey after reading it. I may go back and try the Delilah Dawson story someday soon. All three stories were good. I'm a big fan of both the Iron Druid and Miriam Black, so those stories were a pretty easy sell, but I enjoyed the story by Delilah S. Dawson as well. It's the second story I've read in an anthology set in her Blud series and I'm intrigued enough now to want to read more, so the anthology model definitely worked again to both make money and make a new fan. It appears to be the earliest in the series chronologically, even earlier than the prequel in Carniepunk, but I' All three stories were good. I'm a big fan of both the Iron Druid and Miriam Black, so those stories were a pretty easy sell, but I enjoyed the story by Delilah S. Dawson as well. It's the second story I've read in an anthology set in her Blud series and I'm intrigued enough now to want to read more, so the anthology model definitely worked again to both make money and make a new fan. It appears to be the earliest in the series chronologically, even earlier than the prequel in Carniepunk, but I'm not familiar enough with the series to be sure about that. It definitely predates the main novels in the series, since the main characters haven't met yet and it predicts their meeting. I know almost nothing about the series and didn't feel at a loss at all reading it, I don't think any knowledge about the world is needed, though fans will probably find extra significance in some aspects of the story. On the other hand, the Iron Druid story by Kevin Hearne is really only for fans of the series. It takes place between books seven and eight and is actually a bridge between the books, according to the author's blog. In fact there is information in the story that leads directly into book eight. Hearne doesn't fill in much background or try to make it a stand-alone story, so I wouldn't recommend buying this book if trying out this series for the first time is your goal, there are other stories and books that would be better options. (Though I definitely recommend trying it out, it's one of my very favorite series, get the first book, Hounded, it's so much fun.) The Miriam Black story maybe could be an entry point, it might be intriguing to new readers, but if it was me, I'd also be very frustrated all all of the stuff that I didn't know, since it very much also is part of the series and not one of those stories that has characters from the series but can be read separately. It heavily referenced previous story points without really explaining them. I was even frustrated at all of the things I couldn't remember from the past books because of my awful memory, and I'm a big fan. I guess I don't know how new readers would feel. But I think fans would really enjoy it. It reminded me how conflicted Miriam is now and how much she's dealing with, it was a great refresher before the next book finally arrives. (Never soon enough, right?) Like all of Miriam's stories, it was pretty dark, certainly more so than the other two stories in the book, so readers beware. Not that it's anything particularly unsettling, but the first two stories had very different tones than the third story, it's just the nature of those series. Iron Druid is adventure and wit, Criminy's Blud story felt like adventure and sarcasm (I don't know what the rest of the series is like, I gather he isn't the regular narrator), and Miriam is all about determination and survival. Oh, and I forgot to mention the cheese! It was kind of weird. But whatever excuse they used to get these three authors together was fine by me. Tyromancy, predicting the future using melted cheese to see your vision instead of a crystal ball or tarot cards or whatever other tool. Hearne used it in a small way, inoffensively. Dawson's use was the most effective, I enjoyed the person in the story who used the method, she was eerie and interesting, and I look forward to seeing if the information she provided was included in the original stories or if Dawson re-imagined it for this tale. Wendig's use was good too, it seemed weird at first, and it was, but it kind of made sense by the end. Anyway, like I said, I'm glad these guys found an excuse to do the book together. I can't leave this review without mentioning the beautiful art by Galen Dara. She did a piece for each story and they're just stunning, as her work always is. She captures more than just an image, she brings so much movement and emotion into her pieces and picks scenes that represent something important about the story she's illustrating. The one for Wendig's Miriam Black story is especially unique, really special, though of course I'm also partial to any picture that has Hearne's Oberon in it as well, he's such a handsome fellow. I bought this book because I couldn't wait to read the next installment in the Iron Druid Chronicles. Actually, I bought book #8 and then, I bought this one. I don't usually like the little in-between novellas, but this was an exception because it was more than just one story, which most of them are. As it turns out, it was a sweet deal for me. I got more Iron Druid than I was planning on and I was exposed to two authors new to me, and I had a chance to preview their writing style and their char I bought this book because I couldn't wait to read the next installment in the Iron Druid Chronicles. Actually, I bought book #8 and then, I bought this one. I don't usually like the little in-between novellas, but this was an exception because it was more than just one story, which most of them are. As it turns out, it was a sweet deal for me. I got more Iron Druid than I was planning on and I was exposed to two authors new to me, and I had a chance to preview their writing style and their characters. I definitely have to thank Kevin for including the stories by Delilah and Chuck. I really enjoyed both of them and might never have been introduced to either of them, except via this book. Who knew that the future could be told in cheese? Who knew someone would want to write a story about it? I enjoyed all three of them! What unique imaginations and insight. I will be reading more of Delilah and her Blud character, Criminy Stain, and although it was on the more gritty side than my taste usually leads me, I will also be taking up with Chuck's, Miriam, and her journey to end her curse. I don't like when you have to read the novellas to understand the novels. If it's important to the main story it should just be included in one of the main books. A Prelude to War (4/5 stars): This is the reason I got the book and the only one of the three authors I've read. The story is good and advances the plot in such a way that it is a must to read before moving on to Book 8. I wonder if they'll re-cap it in book 8 upon release or publish it on it's own. Not My Circus, Not My Monkeys (4/5 stars): Never read this author before and I know nothing about the world it takes part in, but the story was enjoyable, characters and writing was good, and over all A Prelude to War (4/5 stars): This is the reason I got the book and the only one of the three authors I've read. The story is good and advances the plot in such a way that it is a must to read before moving on to Book 8. I wonder if they'll re-cap it in book 8 upon release or publish it on it's own. Not My Circus, Not My Monkeys (4/5 stars): Never read this author before and I know nothing about the world it takes part in, but the story was enjoyable, characters and writing was good, and over all interesting enough that I'm considering finding an reading the series. Interlude: Swallow (1/5 stars): Another author and series I haven't read, and wish I hadn't read this. The plot is rather dull, full of coincidences, and the characters just aren't interesting. For a stand alone compilation book, it fails. Worse, though, is the writing is sophomoric in the extreme. Chuck Wendig is uncomfortably fixated on the crotch. This is the kind of writing I'd expect from a 14 year old. This story is NOT necessary reading before reading Staked, no matter what Kevin Hearne says in the intro. This basically reads as the first two chapters of Staked, and it is borderline criminal that this is marketed as "must read". I'm a fan of Hearne's Iron Druid novels, and enjoy reading the stand alone short stories. But that's when they're considered the icing on the cake. When we're told we have to read one to enjoy the novels, that's something else all together, and I feel tricked. Having s This story is NOT necessary reading before reading Staked, no matter what Kevin Hearne says in the intro. This basically reads as the first two chapters of Staked, and it is borderline criminal that this is marketed as "must read". I'm a fan of Hearne's Iron Druid novels, and enjoy reading the stand alone short stories. But that's when they're considered the icing on the cake. When we're told we have to read one to enjoy the novels, that's something else all together, and I feel tricked. Having said that, the story itself isn't bad, giving us a bit on both Atticus and Granuaile. Granuaile's section might be a bit more connected to the subsequent events in her first chapter in Staked, but Atticus' story has no real bearing whatsoever. I only read the first Iron Druid story. The story itself was good. However, the story is essential to Staked and should have been included there. This was a money grab, author exposure, or both. I wouldn't have been as annoyed if the Iron Druid story was available stand alone at a reasonable price. Instead, I paid for two short stories that I don't care about just to read the Staked prologue. This is short story from 3 different authors. To be honest I only read the one from Kevin Hearne in preparation for reading staked. I really missed the Iron Druid series, so any story with Atticus and Oberon I think is great. The second is the old Polish saying “Not My Circus, Not my Monkeys.” A saying basically saying (simplistically) “not my problem. I also always appreciate Kevin Hearne’s dedication to research – as while the other authors have come up with their own ideas for what Tyromancy involves, Hearne has actually gone to the original definition and method. The story also nicely touches on her last relationship – a deep and abiding love that led her to seek isolation when her lover died which is a nice element of character building I appreciated along with examination of her ethnicity and history. It’s a short story and she’s a briefly appearing character, I could understand her not being well developed. I like that some effort was made to make her more than just the woman who tells the future using cheese. Not My Circus, Not my Monkeys is a Blud Short Story by Delilah S Dawson – and unfortunately I’m less of a fan. But, then, I think that stems from the same criticism I had of Prelude to War. If you’re not familiar with the series and world building, this is a hard one to follow. And while I know the Iron Druid Chronicles I don’t know this series and was kind of lost. There was a lot introduced in a very short time, a lot of concepts and creatures to understand with a lot of different cultures and shifts that I just found too much work to invest in and follow a rather alien character as Stain as well. This isn’t a criticism of this story – in fact it makes me hopeful for the main series because it’s clear it is involved and rich and with a very broad and deep world building which is impossible to sum up easily. I also wasn’t a huge fan of this main character but, then, I don’t think I was meant to be, or of his romantic ambitions (with a nice twist at the end). On the whole I didn’t enjoy this story but I’m intrigued by the series. It's very rare to find an anthology where you've read all (and are up to date on the relevant series by) the contributing authors. It's never happened to me before, at any rate! 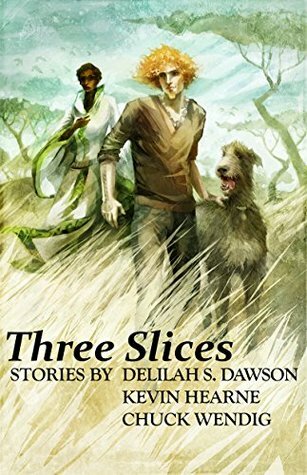 So of course when I saw Three Slices, which has stories by three awesome urban fantasy writers, I had to buy it. I maybe should have guessed from the title, but all three stories have one thing in common: oracular cheese. (Yes, cheese.) That element was really cute, and was one of the things that tied the stories together It's very rare to find an anthology where you've read all (and are up to date on the relevant series by) the contributing authors. It's never happened to me before, at any rate! So of course when I saw Three Slices, which has stories by three awesome urban fantasy writers, I had to buy it. I maybe should have guessed from the title, but all three stories have one thing in common: oracular cheese. (Yes, cheese.) That element was really cute, and was one of the things that tied the stories together. There were a few other things, some of them more subtle than others -- Kevin Hearne gives a nod to Chuck Wendig's heirloom apple obsession, for example, while Chuck uses the Polish expression that is the title of Delilah Dawson's story. I loved seeing those little easter eggs sprinkled throughout. On the stories themselves, I enjoyed all three, although Delilah's story was probably my favourite, mainly because -- of the three of them -- it was the one that stands alone the most cleanly. For fans of her Blud series, seeing how Criminy Stain winds up in the circus he's the ringmaster of in later books is very entertaining, and Criminy is still my favourite smoking hot magician vampire. As for A Prelude to War, I did enjoy catching up with Atticus, Oberon and Granuaile, but this story is the least able to stand alone. If you haven't read the series up till this point, you will be lost. Still, it was very satisfying to see Granuaile's interaction with Loki, though. Loved the Kevin Hearne story. The other two were OK but not insanely good. All three stories revolved around tiromancy...which is using cheese for divination. A weird subject to share and something I never knew existed. I enjoyed both the Iron Druid (Kevin Hearne) short and the Blud (Delilah S. Dawson) short, but must admit I was a bit lost with the Miriam Black (Chuck Wendig) short. First, I am an existing fan of the first two and listened to the Iron Druid in audio throughout, so the novella was like sliding back into a comfortable shoe in preparation for the new release. Although I've read perhaps half or more of Dawson's Blud series I had not previously listened to any of the audio for it. I have to say I re I enjoyed both the Iron Druid (Kevin Hearne) short and the Blud (Delilah S. Dawson) short, but must admit I was a bit lost with the Miriam Black (Chuck Wendig) short. Although I've read perhaps half or more of Dawson's Blud series I had not previously listened to any of the audio for it. I have to say I really enjoyed the audio for this. The story is a prequel about Criminy and how he acquired his carnival as well as when he received his first foreshadowing about where his love would inevitably come from. I found the narrator for Criminy more perfect than my imagination, and that's really saying something. I may have to go back and find these books in audio, at least the ones that feature Criminy. I got this book just to read the Kevin Hearne Iron Druid story as I don't read the other authors work. Atticus is going to Africa to meet up with a powerful fortune teller who uses cheese production to map out the path of the person visiting her. He has need of important information and risks travelling to meet her, knowing that Werner is on his trail. She previously led led Atticus to his faithful hound Oberon and a safe haven in Tempe so he trusts her cheese to direct him. We learn of the other I got this book just to read the Kevin Hearne Iron Druid story as I don't read the other authors work. Atticus is going to Africa to meet up with a powerful fortune teller who uses cheese production to map out the path of the person visiting her. He has need of important information and risks travelling to meet her, knowing that Werner is on his trail. She previously led led Atticus to his faithful hound Oberon and a safe haven in Tempe so he trusts her cheese to direct him. We learn of the other decisions that he made based on her information which have greatly affected his current situation, and Atticus is less pleased to learn that she has also assisted his enemies in learning things about him. I found this very interesting and it was good background to the ongoing plot and to things that have already happened. While Atticus is hoping that the cheese will be ready before the enemy arrive, Granuaile is seeking advice of her own in Asgard about how to remove Loki's mark. There are some short stories that can be missed in the series as they don't add anything to the current plot but this is not one to avoid. There is important information and I would suggest reading it before you get to Staked as it sets up the start of that book nicely and tells you why Atticus has returned to Toronto. Without knowing I read this one in order! This is a set of three stories with the theme of tyromancy. I liked the first one the most since it is the only one I whose general series I follow of the three. Second story was a bit longer for me and it pushed me in a very different setting with predominating unknown fantastical creatures. It has taken me a bit to get into it but I really liked it in the end. The last story was good but the theme strayed to horror and macabre more than I usually like. I am a huge a Iron Druid can and I really enjoyed this latest tale of Atticus & Oberon. 5 Stars on story 1. I am familiar with the world of Mr. Stain and found this story a light a fun prequel to the series. 4 Stars on story 2. I had no prior world knowledge of the third story. This left me unattached to the characters and not caring enough t I finish the story. Didn't finish reading (Lemmed) story 3. Stories written distinctly different but compliment. Enjoy a good read and wander a different way. Travel to something familiar then a dark road to the unfamiliar. My name is Michael, and I'm an Iron Druid addict; I'd read anything with Atticus and Oberon in it! Great short story, spiked with cliffhangers for fans of the series awaiting the next installment. A great teaser to get us through the wait for #8. No real happy with this. Reading Prelude to War because as I started "Staked" it warned that I might miss some things and they could be found in this book. First of all, I'm not okay with a continuing book telling me to buy a novella or i'll miss some things. In fact, the ONLY reason I read this was because I got it free for an Audible Trial on Amazon. Secondly, Why make a novella that is in between books. If you're so keen on us reading it, make another book. It was 6 chapters that could've eas No real happy with this. Reading Prelude to War because as I started "Staked" it warned that I might miss some things and they could be found in this book. First of all, I'm not okay with a continuing book telling me to buy a novella or i'll miss some things. In fact, the ONLY reason I read this was because I got it free for an Audible Trial on Amazon. Secondly, Why make a novella that is in between books. If you're so keen on us reading it, make another book. It was 6 chapters that could've easily gone into the prologue or added to the beginning of the book. Third and last, it's a short story so don't expect anything. 3 chapters of Atticus' view and 3 of Granuaile and the only way to purchase this novella is through audiobook, which means someone is reading it to you. One guy with an annoying voice and made Oberon sound terrible. So I read these stories since I am a huge fan of the Iron Druid Chronicles. This was delightful and I enjoyed it. It was much like the other extra stories from the series. Also enjoyed this story. I really love Kevin Hearne's style and this fit really well. I found myself looking for more books written by Delilah Dawson. It wasn't a bad story but it din't feel like it fit with the other two stories. For starters the style of writing was much di So I read these stories since I am a huge fan of the Iron Druid Chronicles. I loved Hearne's story of Aaticus and the Tyromancer. I guess these three stories have that in common: reading the future through cheese. The second story was by a different author and I didn't like it. The third story, by yet another artist was pretty full of violence, and all the stuff that does not make for a good story. These last two come with the necessary 7.5 in the Iron Druid Chronicles, but I wish I hadn't read them. Now I know what authors not to buy.